This year,we celebrate our eighteenth year of providing information on disease prevention,education, and counseling to our community and we are proud of our history of serving as consultants to the media and social agencies on public health concerns in our community, as mentors to our newly-arrived colleagues, and as educators at our schools, churches, sports groups,and other community-based organizations. Educate and empower the community through seminars, workshops, forums, and initiatives focused on educational and other current issues and events that unfold in the community. » Spread Dominican identity and heritage pride. » Channel resources to create community projects. » Create a global network. 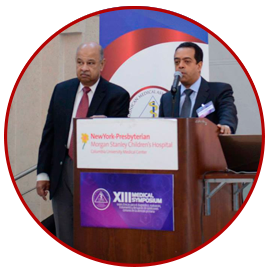 Medical Education through monthly conferences and annual symposiums which keeps our members and the community informed on disease prevention, anticipatory guidance, counseling and treatment of the most common illnesses affecting the New York city community. EDUCA is a program for the community directed by Co-chairman Dr. Roberto Moran, which educate through conferences in churches, schools, health fares, radio and tv programs. Our members receive job opportunities in the medical field. To join our email list and receive information on DMA, new magazine, projects, news, events, and more. Donate here.